Plecostomus (Loricariids), commonly called Plecos, armored catfish or suckermouth catfish comprise several species of freshwater armored catfish belonging to the Loricariidae family. All of these species (well over 680) have hard bony plates that cover their upper bodies. They also have specially adapted sucker mouths which allow them to attach themselves to underwater substrates. Most plecos are peaceful bottom dwellers and make excellent community tank additions. They graze over the bottom of the tank and clean up excess algae and uneaten fish food. 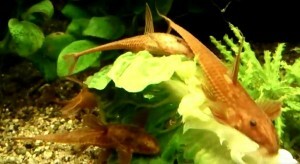 Some of the smaller species are excellent algae cleaners and spend their time vigorously cleaning individual plant leaves as well as the sides of the tank. Plecostomus are usually sold to tropical fish keeping enthusiasts when they are young and small, however in their native habitats many species can grow to over 2 feet in length and should be housed in large tanks. Plecos (Loricariids) are found on both sides of the Andes in the varied freshwater habitats of Panama, Costa Rica and South America. Although this species’ native range is in tropical South America, it also naturally occurs in Guyana, Brazil, Trinidad and Tobago and Suriname. Plecostomus inhabit fast flowing streams, torrential mountain rivers, black acidic waters, quiet brackish estuaries, and are even collected from subterranean waterways. Plecos are found in a wide range of variable color patterns and body shapes, but all have have a ventral sucker mouth with small projections (papillae) around their lips. The adipose fin, when present, usually has a forward spine and in most Ancistrini species, sharp evertible cheek spines. These cheek spines (elongated odontodes) are usually more developed in males for use in displays and offensive combat. Plecos mouths and teeth are adapted to feed on a wide variety of foods and some species even have the ability to eat and digest wood. In their natural habitat, fast flowing streams, they attach themselves to rocks and graze on algae, aquatic plants, detritus and frequently on small invertebrates. Most species of Plecos are nocturnal, some are territorial, and others (like the Otocinclus) prefer living in small groups. Many species of Plecostomus are air breathers and can live out of the water for many hours and still survive. Loricariids are facultative air breathers and can survive out of water for long periods without adverse effects. They will only breathe air when under stress, and then use their gills only during high oxygen level conditions, such as during dry seasons when evaporation causes severe drops in water levels and oxygen content. Plecostomus are occasionally consumed in their native range but have little to no value as a food fish. Their main attraction is for the aquarium trade where there is a great demand for them as algae cleaners. Because of the huge number of unknown Loricariids species, a two-part scientific naming system was first devised by Carl Linnaeus in the 1700’s and farther refined in the 1800’s to identify specimens until an official scientific name could be created. The numbering system for unknown fish, started with L001 (L standing for Loricariidae) and continued for each unrecognized fish. Once an official scientific name was created, the old L-number was supposed to be retired however, many tropical fish keeping enthusiasts still use these numbers to help identify their specimens. Click here for L-numbers and associated Wikipedia articles listed in numerical order.